If your baby or child has developed a rash, try not to panic. 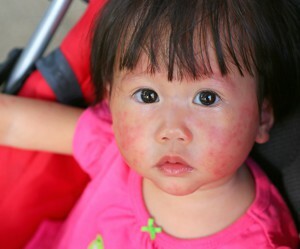 Rashes are common in children, particularly younger children and babies, and are often a normal reaction when encountering viruses or allergens. Most of the rashes that will appear on your child’s skin will be harmless, or a sign that he or she is combatting a relatively mild illness. What Are The Causes Of Skin Rashes In Children? Many rashes are as a result of common childhood illnesses, such as Chicken Pox, Slapped Cheek Syndrome, and Hand, Foot and Mouth Disease. Your child will probably have other symptoms, such as a fever, runny nose, and generally feeling unwell. In the case of rashes with illness, it’s best to get a confirmed diagnosis from your GP. Some rashes are associated with more serious illnesses, such as Meningitis, and these need immediate treatment. Rashes in new-born babies are fairly common. Your baby may be born with Milia, which are tiny white spots on his face caused by block pores. This is harmless and will clear up within about a month. Some babies also develop “baby acne” with pimples appearing on their face. These will also clear up after a few weeks. Around one in five children will develop eczema at some point in their lives. For some it may be a mild condition with small patches of dry itchy skin, for others it can be more severe with blisters and large patches covering most of the body. You can get creams on prescription but it may take a while to find the right cream that works with your child. Some forms of eczema are also associated with food allergies, so it may be worth investigating this further. Your child may develop a rash as a result to a reaction from products such as bubble bath, creams, or detergents. Always wash new clothes before putting them on your child to wear, and use a non-biological laundry detergent without perfumes. Look for sensitive skin friendly products, including wipes, creams, and bath products. Your child may develop a rash after eating a particular food. It is best to speak to your GP if you think this may be the case, particularly as food allergies in children are becoming increasingly prevalent. My Child Has A Rash, Should I Be Concerned? If your child has developed a rash but otherwise appears well, then it’s probably nothing to worry about, but if it does not clear up after a day or so you can book a routine appointment with your GP to get it checked, or see a Health Visitor. If your child has other symptoms, such as cold symptoms, fever, etc., then the chances are that he or she is suffering a common childhood illness, but it is worth getting checked by a doctor. A high fever (above 38 degrees centigrade for babies under three months old, and above 39 degrees for babies under six months old) or one that does not respond to infant paracetamol. Has vomiting or diarrhoea, or has refused liquids for more than 8 hours, or is showing signs of dehydration, such as a lack of tears, a lack of urine, and skin that doesn’t immediately spring back when gently pinched. Unresponsive or seems floppy, or is very sleepy and difficult to wake, or has a staring expression. Swollen or sunken soft spots on their head. A rash that does not disappear when a glass is pressed against it.